2019 Audi TT: Can You Spot the Changes? The refreshed 2019 Audi TT just showed its face, but unless you’re an Audi enthusiast, it’s basically impossible to spot major differences between it and the outgoing model. The cars look nearly identical. 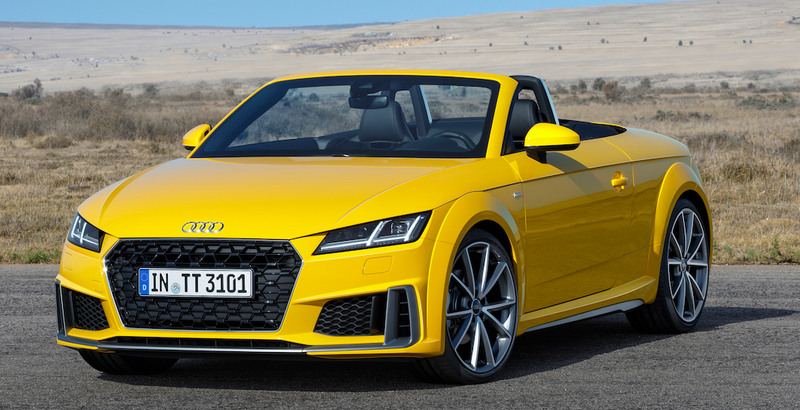 “The new Audi TT—an update for the design icon,” Audi’s press release for its refreshed roadster reads. According to the Ingolstadt-based brand, the exterior is now more “masculine, more progressive and even sportier” than the outgoing model, with Audi highlighting the “Singleframe” grille and large outer air inlets on even the base models. The S line, shown above, gets a full-length splitter up front, a blacked-out grille, special side sills, and “vertical air inlets” (which I assume mean those at the outside of the lower fascia). The changes from the outgoing model are, um, existent? I guess? Obviously the wheels are different, and the new car’s grille is a bit more TT RS-ish than the pre-facelift TTS, but I mean, just look at those two cars—if they were humans, they’d be identical twins, with the bottom one maybe wearing a set of braces and some flashy shoes. Audi says the new TT has a “sporty rear end” highlighted by horizontal lines. The new TT, shown above, has a wider diffuser, as well as vertical air inlets containing three horizontal fins underneath the rear lights. In addition to the design tweaks, Audi says the new car will come with more standard equipment, including Audi virtual cockpit, Audi’s drive select dynamic handling system, a rain and light sensor, heated mirrors, illuminated USB ports, bluetooth, a capless fuel filler and a multifunction steering wheel. As far as engines go, Audi’s release doesn’t reveal much, saying just that there will be a “range of petrol engines in various performance levels” available, and that they’ll be bolted to either six-speed manuals or a seven-speed dual-clutch automatic (Audi says the seven-speed S tronic is new). I’m not sure where Motor1 got its information, but the car website alleges that all TTs will get 2.0-liter engines, which will be offered in 40 TFSI, 45 TFSI, 45 TFSI Quattro and TTS trims. The base 40 TFSI, the website says, will crank out 197 horsepower and 236 lb-ft of torque, whereas the other two TFSI trims allegedly make 245 horsepower and 272 lb-ft. As for the Audi TTS, Motor1 says that’ll make 306 ponies and 295 lb-ft. (It’s worth noting that these numbers largely line up with Autocar’s). The slightly-updated TT will be available in some European countries starting in the fourth quarter of this year, with pricing starting at 35,000 euros for the coupe and 37,500 for the roadster. You can wait for it, or you can just buy the current TT, and lie to everyone at car shows that yours is a 2019. Because I bet nobody’s going to ever be confident enough to call you out on it.